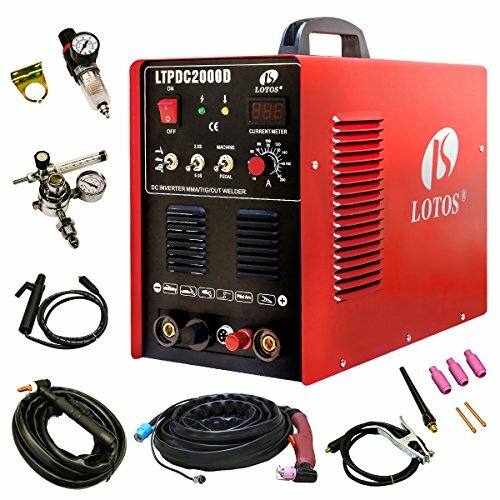 The Lotos LTPDC2000D is a first to market multi purpose welder that allows the user to DC TIG/Stick weld and plasma cut all from one portable machine. LTPDC2000D combines 3 functions into one with a 200amp DC TIG Welder, a 200 Amp Stick Welder, and a 50amp Pilot Arc Plasma Cutter with the flip of a switch. It is able to cut various types of metal up to 1/2 inch with the 50A pilot arc plasma cutting function. It is designed especially for businesses and DIY (do-it-yourself) users, while fully accommodating the demands of professional operators. An optional foot pedal is available for purchase. [TIG Welder] 15-200AMP DC TIG Electric Current Output; Quality TIG welding on Stainless or Steel and Precise Welding of Thinner-gauge Materials;HF; Both HF start hand torch control and Support Precise Foot Pedal Welding Heat Control(Foot Pedal NOT Include). If you have any questions about this product by Lotos Technology, contact us by completing and submitting the form below. If you are looking for a specif part number, please include it with your message.